It's Sunday and time for Sunday favorites. This was a favorite of mine on March 24, 2009. 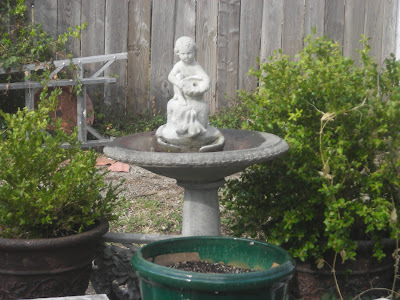 I'm not sure if it was the weather or I just didn't have the time before then, but in 2011, I'm much ahead of the game for on Saturday, I readied the birdbaths for our feathered friends. We may get a few frosty mornings but it won't hurt the birdbaths for it's not an extended freeze and it is always so much fun to see the birds frolicking in the water! It's a rite of Spring -- an annual rite that I enjoy! Please join Chari at Happy to Design for Sunday favorites!!! Before Spring, outdoors is limited on the prairie for winter is mostly brown. We sometimes have snow, we sometimes have ice, and we even sometimes have rain. But we welcome Spring (as we welcome the coolness of fall after the heat of summer) with open arms. It's fun to see the world wake up and watch spring come. And with the first few warm days, it's time to get all of the bird baths at Linderhof ready for our feathered friends. We do keep one operational during winter with a heater -- and the birds appreciate their spa even in the cold weather. We've noticed a greater number of birds since we opened our "spa". But we like to have water available in different areas of the garden in the summer. And in spring, cleaning them, putting them back and filling takes an afternoon. We do it as soon as the weather seems warm enough. Even if we get a freeze (even a deep one) -- the frozen water once in the bowl will not harm it. This is a favorite -- with two doves in the middle. It's concrete, stained so it looks a bit old. We've planted daffodils and tulips around it (and there are two roses beside it) and will plant Stella d'Oro day lilies in between the spring bulbs. It's on one size of our pergola and our doves (the turtle ones) seem to like it the best. A smaller one that I can see from the kitchen window. It has a non working fountain in it and the little birds seem to prefer this one. There is lettuces in the pot below -- starting to show green. 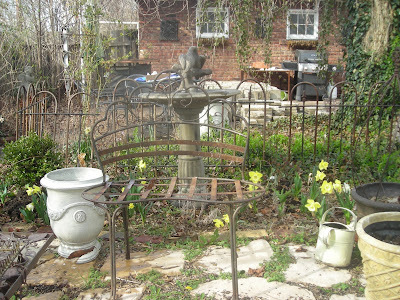 The side garden, my secret garden has this birdbath (with the rabbit to keep it company) -- it was a gift and I like the smallness of it and it's perfect for this corner of my secret garden. 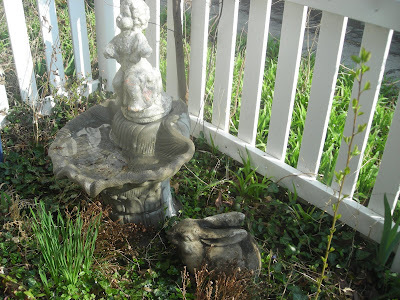 A sqaure birdbath that looks as if it has some age, but alas, it doesn't. I like the fact that it looks like it has been around forever. 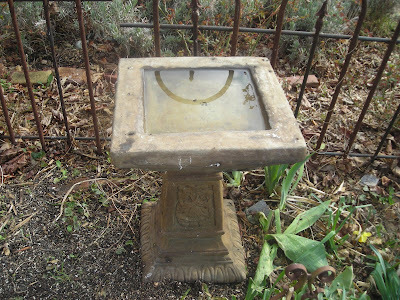 A bird feeder is to the left of the bird bath and often the birds will snack, fly down for a sip before they fly back up for another bite. I like things with age -- or things that look like they have age and most of our baths do. They look like they've been in the garden at Linderhof for a long time -- even though the square one was a last year purchase. The birds enjoy water -- both to drink and to bathe. We get a lot of joy out of watching the birds antics in their baths, as both the first and the last can be seen from our breakfast room while the shell birdbath can be seen from my desk which overlooks the secret garden. Sweet bird baths we also put out a few and try to change the water daily. while watering our planted pots. But sadly spring is not here yet and it is still in the 30's with snow covered ground. Can't wait for spring. Oh, Martha, you do share the loveliest things. A guy from Jersey doesn't get to see this kind of natural beauty often. I'm glad I found your site when I did. Adore the birdbaths! Yes. . .the activity here on this side of the prairie has been busily, as well! My favorite would have to be your "new" square bird bath. Hasn't the singing been divine this past week? No better alarm clock that awakening to the songs of the birds! Your birdbaths and all your garden ornaments are lovely. Now that the days are getting longer it is a delight to wake to the birds dawn chorus in the mornings. Your bird baths for your lucky bird visitors are lovely. You have such precious rituals at Linderhof and I so enjoy your generosity in shareing them with us your devoted readers. Thank you again for inspiring me to tend to our rituals too. I love birds in the yard - - - at feeders and baths. How is your spring progressing out there in the "far" west??? Is your ground devoid of its white blanket? We're still draped in white here, but if the temperatures are as warm as they are predicting for this coming week - - - I may be singing a DIFFERENT tune by next Suday's Favorites. Ohhh...you have so many beautiful masonary pieces, Martha! I love all of your beautiful bird baths! Yes...it won't be long till we will have to start cleaning up...spring is nearly here! Well...we have snow on the ground at our place right now...but hopefully soon! Hehe! Thank you so much for sharing this lovely post with all of your garden pretties with us for the Sunday Favorites repost party this week!